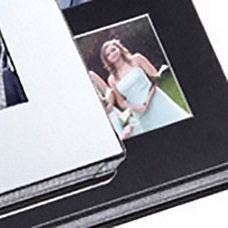 Sigma overlays are manufactured for use with the Sigma style of album only. The aperture of the Sigma overlay has a bevelled instead of a plain cut edge, revealing a complimentary coloured core; this overlay is available in varnished black textured board with a white bevel and white varnished textured board with black bevel. Be the first to review “Sigma Overlays” Click here to cancel reply.